It was a welcome break from the dogged UPA-BJP bickering over recent scams. The BJP saved the UPA a major embarrassment when it supported the pension Bill, which met with Leftist opposition in Parliament on Thursday. The Bill was sought to be tabled at a time when many Congress leaders were not present in the House. A CPM leader pressed for a division of vote and the BJP support ensured a 115-43 vote in the Bill’s favour. While it is entirely within the prerogative of the British government to decide which aspiring visitors or students it wants to admit to Britain, the planned move to cut up to 80,000 student visas, has caused concern in the academic community in Britain, as well as potential students. Ah, the thud of Australian fall! It was only a quarterfinal encounter but since it was against the four-time World Cup champions Australia, it was as good as the final for most of the cricket-crazy spectators. The whole of India was mighty optimistic, of course – we always are – but given some perennial weaknesses of the men in blue, the assertions were phlegmatic. However, dreams did come true on Thursday night at Ahmedabad when Dhoni’s boys beat the Aussies fair and square. Addressing the University of Agricultural Science and Technology in Jammu in the first week of March, Prime Minister Manmohan Singh said that despite all the problems India had been faced with, it had decided to resume the dialogue process with Pakistan. India would being the talks with Pakistan with an open mind with a wish to resolve all the outstanding issues between the two countries through friendly, constructive and purposeful negotiations. I will not call her some Mrs X. To ‘Mrs’ her would be bracketing her. nor am I concealing her identity. I would rather name her as a vowel, say, ‘O’. Because, unlike a consonant, a vowel spells immense possibilities! THE policemen at the grassroots do not get the attention they deserve. When a crisis erupts suddenly at the cutting edge level, they find it difficult to handle it in the absence of adequate training. Their intelligence system often fails and things go out of control, making it difficult for even their seniors to salvage the damage done. No doubt, the hard-pressed subordinates have a plethora of jobs at hand. And each task cries for attention. 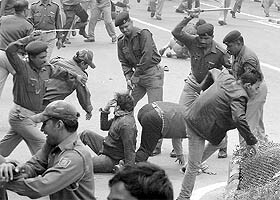 The Supreme Court’s judgement in the case of Prakash Singh vs Union Of India (2006) marks a defining moment in the history of Indian Police. It endorsed the view of the National Police Commission (1978-81) that Indian Police has become the handmaiden of the ruling party, alienated from the people and has become professionally incompetent. It was a welcome break from the dogged UPA-BJP bickering over recent scams. The BJP saved the UPA a major embarrassment when it supported the pension Bill, which met with Leftist opposition in Parliament on Thursday. The Bill was sought to be tabled at a time when many Congress leaders were not present in the House. A CPM leader pressed for a division of vote and the BJP support ensured a 115-43 vote in the Bill’s favour. The Congress and the BJP, by and large, agree on second-generation reforms, which have got stuck due to politicking. The Pension Fund Regulatory Development Authority Bill 2011 is the UPA’s second attempt at pension reform. The first was thwarted in 2005 when the Leftists refused support for the legislation. The Bill was then referred to a standing committee of Parliament. The redrafted Bill aims to set up a regulator for the pension sector and open up a new pension system in which contributions are defined but terminal benefits to the members are not guaranteed. A part of the pension funds is slated to be invested in stock markets. The Leftist opposition is based largely on this. The government’s switch-over to the new pension system has been propelled by the growing pension bill of its employees. The burden will rise in future as life expectancy increases. Government revenue may not be rising accordingly unless taxes are raised sharply – not a happy option either. Hence, the reform. Twenty-seven states too have agreed to join the new pension scheme. The government has cleverly kept the issue of foreign direct investment outside the pension Bill. This means Parliament will not be able to debate or set a limit on FDI in the new pension system. The government’s move to increase the FDI limit from 26 per cent to 49 per cent in insurance has got scuttled by political opposition. Therefore, it did not want the pension Bill to get caught in a similar political gridlock. However, with BJP help, the Bill may sail through. While it is entirely within the prerogative of the British government to decide which aspiring visitors or students it wants to admit to Britain, the planned move to cut up to 80,000 student visas, has caused concern in the academic community in Britain, as well as potential students. Vice-Chancellors of British universities have warned of the threat to higher education institutions posed by visa restrictions, which will cut students from non-European Union countries, including India, by 25 per cent a year. Overseas university students to the UK generate £5 billion a year, and the economic cost of the cut has been estimated at £40 billion. The British home secretary has a point when she says the education sector is “effectively unregulated”, that some of the institutions are not up to the mark. Studying in the UK has been a dream of generations of international students, who are attracted by the quality of education available there. The British authorities, even as they set their own house in order, must ensure that genuine students who seek to study in Britain do not face any hardship. Within Britain, too, the need for a proper debate on immigration rather than rushing into major policy changes has been voiced, notably by Keith Vaz, an Indian-origin MP, who has pointed out that the government should “recognise the price it will pay if it does not think carefully about all those that contribute to Britain’s success at home and abroad”. A recently-published report by the British home affairs select committee on student visas too has concluded that limiting genuine international students could damage Britain’s reputation as an international education hub. In the global village that the world has become, students naturally seek the best institutions they can get into. Britain has been a favourite, but for those considering other destinations, the visa cuts and other restrictions could well be the proverbial last straw. It was only a quarterfinal encounter but since it was against the four-time World Cup champions Australia, it was as good as the final for most of the cricket-crazy spectators. The whole of India was mighty optimistic, of course – we always are – but given some perennial weaknesses of the men in blue, the assertions were phlegmatic. However, dreams did come true on Thursday night at Ahmedabad when Dhoni’s boys beat the Aussies fair and square. And what a cliffhanger it was, with fortunes doing a U-turn with every over, till comeback boy Yuvraj Singh and Suresh Raina put all hopes beyond the reach of the three-times defending champions. This is proving to be Yuvraj’s World Cup, who picked up his fourth man of the match title and is in line for the man of the tournament crown as well, but it was a team effort all the way. The most notable improvement has been in fielding where some 15 runs were saved, which proved crucial when India chased. Sachin Tendulkar missed his century of centuries but his contribution was tremendous. What mattered most in this game was that the team showed ample self-belief and held its nerves when it mattered the most. Otherwise, the cheap dismissal of Virender Sehwag and Dhoni and runout of Gautam Gambhir had earlier raised the fears of an all-too-familiar collapse. To that extent, the victory over Australia should do a lot of good to India’s confidence. The famous triumph has set the stage for an epic semifinal clash against arch-rivals Pakistan in Mohali. That is now The Match of the tournament. Pakistan too have surged into the semifinals while firing on all cylinders, but India have never lost to them during their four World Cup encounters and will be hoping that history will repeat itself. If India can cure themselves of the occasional hiccups they suffered from during this edition of the World Cup, they start as clear favourites. The count-down has begun. The Prime Minister emphasised that having said that, “We cannot forget what happened in Mumbai”. The Government of Pakistan should leave no stone unturned in bringing the culprits to book. The activities of the extremist groups in Pakistan remain a source of concern. Unfortunately, Pakistan has been stonewalling all the promised trials of individuals identified as complicit in the Mumbai attacks. The Foreign Secretaries of India and Pakistan, who met at Thimphu during the recent SAARC meeting, agreed to have a meeting of the Home Secretaries of the two countries in Delhi in the last week of March. It has to be understood by Pakistan that dialogue and terrorism cannot go together. based militant outfit, the Lashkar-e-Toiba (LeT), who guided the attack from Pakistan. The FBI’s disclosure that US citizen David Headley had played a key role in reconnoitring the 26/11 targets numerous times during the two years before the Mumbai attack filled the important gaps in the continuing investigation, especially regarding how the militants who attacked gained detailed knowledge of their targets in Mumbai. Pakistan has so far not agreed to India’s request to let an Indian team interrogate them. India was incensed by a string of lethal attacks on Indian nationals in Afghanistan with Pakistan’s complicity. US officials confirmed that Pakistani militants were responsible for bombing the Indian Embassy in Kabul two months before 26/11. A detailed report had recently appeared that Pakistan was responsible for pushing fake Indian currency notes into India and these activities were being carried out routinely by the Pakistani embassies in Nepal, Bangladesh, Thailand and at some other places. The entire operation on the part of Pakistan is nothing short of an economic warfare and an exercise of “bleeding India with a thousand cuts” which is the avowed state policy of Pakistan. The 2011 International Narcotics Control Strategy Report (INCSR) brought out by the State Department of the United States has said that criminal networks exchanged counterfeit currency for genuine notes and this has facilitated money laundering on a scale that represents a threat to the Indian economy. The report went on to state that India’s economic and demographic expansion made the country an increasingly significant target for money laundering. Speaking at a function to mark Kashmiri Solidarity Day, which Pakistan officially observes annually, Jamat-ud-Dawa (JuD) chief Hafiz Saeed advocated at Islamabad on February 6, “Kashmiri Solidarity Day has come at a time when India and Pakistan were trying to revive the peace process.” Saeed blamed India for masterminding the Mumbai attack and added that India should quit Kashmir or should get ready to face a war. Saeed said that in the jihad against India, if needed, even nuclear weapons should be used by Pakistan. Islamabad did not take any action against Saeed. It is a well-known secret that the LeT and the JuD both enjoy the patronage of the ISI of Pakistan. The Intelligence Bureau had recently warned the Chief Secretaries and police chiefs of the states regarding the plans of Al-Qaida and the LeT to mount attacks on the World Cup Cricket matches to be held in important cities, and asked them to take all precautions to avert such possibilities. This warning cannot be taken lightly and Pakistan will be judged on the steps taken by it to check their activities. One of the latest WikiLeaks documents quotes the US National Intelligence officer for South Asia, Dr Peter Lavoy, as having given an assessment on Pakistan which states that despite the pending economic catastrophe, Pakistan is producing nuclear weapons faster than any other country in the world. There were earlier reports that the nuclear stockpile of Pakistan was much more than of India. Dr Lavoy’s estimate on Pakistan producing nuclear weapons faster than “any other country in the world” is alarming indeed for nuclear powers all over the world and India in particular. Dr Lavoy’s another important assessment on Indo-Pak relations is that “Pakistan continues to define India as its No. 1 threat” and that the ISI continues to provide intelligence and financial support to insurgent groups to conduct attacks in Afghanistan and India. In Pakistan itself, the internal security situation seems to be worsening. Contrary to what Pakistan President Asif Ali Zardari says in his article in The Washington Post that “we will not be intimidated nor will retreat against the acts of extremism and religious fanaticism”, Pakistan Army Chief Gen Kayani declined to condemn the killings of Bhatti and Taseer, fearing revolt in the Army. In the case of American national Raymond Davis, the religious and right wing forces are said to have pressured to pay up blood money for resolving the case, which meant the US might have to cough up money for ensuring the release of Davis, even though Mr Zardari had said that Pakistan was committed to peaceful adjudication of the vexed issue. Davis has since been released after blood money was paid to the relatives of the two persons who were shot dead by him. However, the US mission in Pakistan has denied having paid any blood money. Who actually paid it may not be relevant. One of the important topics for dialogue between India and Pakistan would naturally be Kashmir. As for Pakistan, the Kashmir issue is the most important one. The four-point formula which was almost finalised jointly by General Musharraf and Dr Manmohan Singh lost its relevance with the deposition of General Musharraf. The Pakistan Army Chief had reportedly vetoed the formula as unacceptable. However, during the visit of the then Foreign Minister of Pakistan last year, one got the impression that General Kayani was not against the Musharraf formula and that some quiet negotiations were going on. It is known that some important personalities are busy on Track-2 negotiations to work out an agreeable formula on Kashmir. However, they do not seem to have hit upon any such formula as yet. Taking into account all these factors, it is rather premature for a composite dialogue between India and Pakistan. The writer is a former Governor and a retired chief of the Intelligence Bureau. She is not precisely my friend, for the simple reason that over two decades of calendar years stretch between us. We met like two strangers often do, in search of something, colliding like two dust particles in the vast emptiness of this world. Ah! One more of those haughty NRIs, observed my mind, when we first met. In two subsequent meetings I changed my opinion. A prodigal daughter! Yet again I was trying to frame her. But, she gave a slip to my frame. She had lived a life on her terms, was evolved, had a sense of humour and well, this was enough for us to click! We always had enough to talk. I admired her wicked vivaciousness. Hilarious anecdotes exposing stiff upper lip hypocrisy of the French and the Americans of the New-England area she had lived with for five decades entertained me. In fact, I wanted to grow old like her! It was after a gap of over eight months that I called her last night. She had been shifted to the general ward from the ICU after two weeks. There was a chirpiness about her voice, as though this small mercy of life was exciting! This was the second time she had gone to an alien city for a kidney transplant, where she did not know a soul. And, this was for the second time that the donor had backed out! She was at the receiving end of humanitarian laws. What she did receive was a serious kidney infection. This was bad news. And I was worried and embarrassed for not calling her up all this while. But, she was talking of the flowers she had seen in my garden before leaving. “The blossom is so generous this year! And, how are you dear?” she chirped with the joy only flowers could evoke. I had not taken note of them for this or that reason! I had stopped meeting her. Her onion-thin skin had begun to show coiled snakes of veins growing darker underneath. Her eyes looked like broken wings of a bird in flight. Her fragile courage was turning brittle. Perhaps I was scared of mirroring old age! For her twice-a-week dialysis, I too had offered to be her chauffeur. But she wanted to walk her miles. Whatever it took! And I left her alone. I do not know if there is a reason behind her bravado. I do not know if she is scared. I just listened to her laughter resonating in a general ward of a hospital last night. And I looked at my neglected garden. There are certain areas where the police action is characterised by highhandedness and violation of the avowed principles of police administration till the final run-up to a satisfactory and fruitful delivery of services expected by society at large. Free registration of crime is still a far cry. Complainants do not get feedback on their petitions, recoveries are fake. And witnesses are non-committal and planted. Police continue to use third-degree methods to get quick results. Forensic science tools are not fully employed. Intelligence gathering is poor. Most arrests are unwarranted; these are made only to extract money in many cases. Poor infrastructure and resources and outdated communication equipment leave the police far behind the criminals. Mr K. Koshy, former Director-General, Bureau of Police Research & Development, suggests various reforms in the Indian context to stem the rot. According to him, “open the reporting in police stations to the public. The sentry should concentrate on the prisoner and the malkhana, not to stand there just to intimidate the public. The reporting room should be made a pleasant place with modern bank-like atmosphere. In the UK, the reporting officers are more often than not civilians, specially trained to handle the public. Call Centre type of training should be given to those who attend the telephones. A PRO, as in the US, should be made available for giving out the latest position of cases, complaints, verifications, and other outcomes.” What we lack in Indian police is their non-appreciation of the concept of “participative policing by the people” as in Singapore; social policing as in Sweden; and community-oriented policing as in the UK, Hong Kong, Canada and the US. Of course, some states like Andhra Pradesh and Madhya Pradesh have taken a lead in this regard by enacting laws and building bridges with the community by setting up police-public committees. Ground work, delivery, action and results will flow naturally if the police adapt itself for purposes of investigation to free registration, faithful recording of a complaint (FIR), recording direct evidence corroborated by scientific and forensic attributes, not using third-degree methods, joining genuine witnesses and not from the stock, not making arrests where they are unwarranted and, above all, winning the trust and confidence of the people. There is a need to tone up the police administration on modern lines. The police can win the hearts of the people by speedy redressal of their grievances; by making themselves available in times of crises; by being courteous; by empathising with them and, above all, by pursuing a thoroughly honest approach to every task they undertake. The International Association of the Chiefs of Police has debated the issue of ‘Citizens Review’ which envisages “public concerns about racial profiling, excessive use of force, deliberate violations of sanctioned evidence handling procedures, and corruption creating mistrust.” The apparent failure to contain these issues causes public policymakers to consider alternatives. As these issues bear focus on the ground zero, every effort should be made to implement them. All action begins with the first-responder not only in a crisis situation but in peace time too. The police reforms should begin with the clearly mandated assignment of tasks, fixing responsibility in case of any failure, ensuring proper and fair recruitment and putting through need-based training, regulating day-to-day policing keeping the community interests and expectations in mind, ensuring a speedy and transparent delivery of service to the stakeholders. Police reforms at the grassroots need to correct the wrongs the functionaries indulge in, in the absence of effective supervision and no accountability fixed on them. Stringent punishment should be given to those found on the wrong side of the law. Action should be initiated against cops for their acts of collusion, highhandedness, corruption and so on. In the US, if a police officer is accused of withholding the truth, or is lying during a trial, in all cases that he stands as the official witness, his testimony is taken with a pinch of salt and is discarded as an interested witness. There is need for separate police wings in a police station to cover four major areas: investigation and detection; law and order; regulatory duties like traffic, service of summons and warrants etc; and special cells to cater to cyber crime, economic offence, juveniles and trauma victims. It is only the tactical squad which should handle riot and arson cases where crowd control is to be exercised. n An average policeman in the country is overburdened with too many duties everyday, besides attending to calls and complaints of various kinds from the people. n Since the ground zero of all activity is the police station, action revolves around prevention, detection and investigation of crime; maintenance of public order; traffic regulation; prosecution and court duties; escorting and production of convicts and undertrials; executing summons and warrants; patrolling the areas and borders; carrying out raids; rushing to accident spots; carrying out various character verifications; VIP security; tracking gangs; and monitoring mafias on radar. n He/she is duty-bound to join parades and drills, acquire knowledge on firearms and ballistics, forensic science, cyber crime, white and blue collar crimes and on gathering intelligence. n Nowadays, the policeman is also involved in tackling crimes bearing on national and internal security, caste and regional conflicts, communications and wireless, video conferencing and crowd control. n There are certain areas where the police action is characterised by highhandedness and violation of the avowed principles of police administration till the final run-up to a satisfactory and fruitful delivery of services expected by society at large. The NPC, after a careful study of the police workload, could find that the police officers spend only 30 per cent of their time in investigation of cases and that most of their time is devoted to VIP duties, court attendance and other miscellaneous chores. No wonder, their core functions — prevention and detection of crime — get step-motherly attention. The NPC made sound practical recommendations for police reforms, which are relevant even today. The Supreme Court issued directives to the Centre and the states to implement the recommendations. Its seven-point directives include: a fixed tenure for at least two years for the Director-General of Police (DGP) unless promoted or removed on disciplinary grounds; separation of the law and order wing and investigation wing of the police; setting up of a Police Establishment Board to decide on transfer, posting and service-related matters of officers up to the rank of DSP; setting up of State Security Commission in every state to prevent the state government from exercising unwarranted influence and pressures on the police; establishing a National Security Commission for selection and placements of chiefs of Central Police Organisations. Unfortunately, many state governments are dragging their feet and trying to stonewall police reforms under various pretexts. They are not at all prepared to slacken their iron grip over the police with a view to misusing it for partisan ends. Most states have averred that though they support the spirit of reforms, they object to many of the directives of the court. States like Gujarat, Nagaland, Karnataka and Andhra Pradesh have questioned the raison d’etre of the State Security Commission. Some states have also brazenly stated that they exert no unwarranted influence over the police. Many states have enacted new Police Acts. But these dilute the core systemic reforms prescribed by the Supreme Court. Some states have set up State Security Commissions but packed them with yes-men and excluded the leader of the opposition to deprive these bodies of a bipartisan character. To retain political control over the police, they have indeed made some cosmetic changes and not meaningful systemic police reforms. The Supreme Court has cracked its whip by setting up a three-member monitoring committee with Justice K.T. Thomas, a former Supreme Court Judge, as its chairperson. The committee examined the affidavits filed by different states regarding measures taken by them to implement the apex court’s directives. It also examined the New Police Acts passed by some states after the Supreme Court judgement of 2006 to find out if they are in keeping with the letter and spirit of the directives. The monitoring committee, in its report, has castigated the states’ non-compliance of the directives. The Police Complaint Authorities have not been created in most states that have enacted new laws. It checked up the ground realties regarding the implementation of directives in respect of four states, namely, Uttar Pradesh, Karnataka, West Bengal and Maharashtra and found that the level of compliance of the Supreme Court’s directives in these states is poor, if not dismal. It deplored the indifference displayed by the states and asked the Supreme Court to view seriously non-compliance of police reforms by the states. The Supreme Court has taken the matter seriously. A bench headed by the Chief Justice adopted a no-nonsense approach and chided West Bengal for putting the Health Minister as the head of the State Security Commission. It also pulled up the Uttar Pradesh government for not segregating law and order and investigation wings of the police. Indeed, the Supreme Court has taken up the implementation of its directives seriously and has ruled that its “order will not remain in limbo”. Though timeframes were given to states to report compliance of various points, the path of police reforms is going to be bumpy. Political masters will try to scuttle meaningful reforms that will make police neutral and apolitical. Sustained campaign by senior police leaders, members of civil society and media is necessary to overcome their resistance and usher in the much-needed police reforms.